I was raised a vegetarian. My family introduced meat around the time I started middle school, but it took me a while to truly become a carnivore. Once during my senior year of college my mom brought home fried chicken and had to pick the white meat off of the bone for me. My budding curiosity was put on hold when I entered college, as cafeteria meat was just too gross to ponder. I started cooking in earnest while studying in Jerusalem during my junior year. Israel was a great place to be a vegetarian. Even on my very limited budget, I was able to eat well and even feed others. For a long time after college I ate (rather pedestrian) meat outside of the house but continued to cook vegetarian dishes at home. Eventually I became too interested in food not to explore. I found myself frustrated by my own taboos and squeamishness. And so I began to push at my own boundaries. While I might not order it as my entrée, I would taste anything. I moved beyond chicken breasts and ground beef in my own meat cookery. 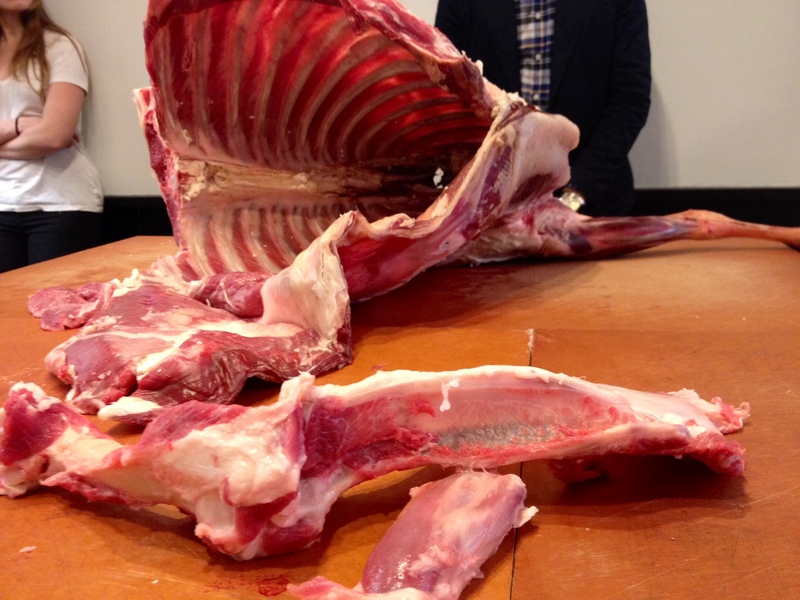 I worked hard at confronting meat that looked like what it was: part of an animal. I delved into braises and barbecuing. I ordered a leg of lamb from an old school pork store and brought it home in the basket of my bike. I bought an untrimmed pork loin and tackled it early one morning in a pre-caffeine haze. The more I worked with meat, the more it became a part of me and my identity. Today I had the opportunity to attend a daylong intensive workshop on butchering sheep as part of Just Food‘s annual conference. The workshop was led by Adam Danforth, who just published two books on butchering. He talked us through slaughter, animal welfare and what makes meat delicious. After a burrito and margarita break (did I mention how awesome this workshop was? ), Adam set to work breaking down a whole sheep and answering our endless questions. A chef was on hand to prepare the various cuts in a simple manner that really highlighted the lamb-y goodness. We rounded out the day with beer, socializing and the chance to pack up a meat cut or two to take home. I went for the shoulder chop, which Adam had explained was far more flavorful than the more conventional (and expensive) loin or rib chops. Adam is a big proponent of the complex flavor and marbling that come with a muscle that works hard. He also encourages the consumption of older animals and challenges the commonly held notion that they are tough. It turns out that a sheep is classified as lamb up until it reaches a year old. Between one and two years old, it is a hogget. And, after two years, it becomes mutton. 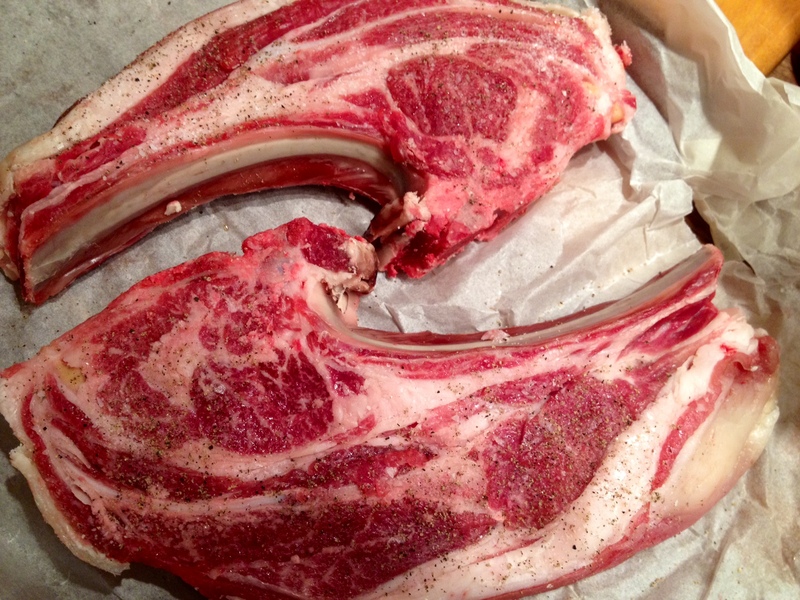 This older meat is darker in color and offers the deeper flavor that lamb aficionados seek. I had plans to go out to dinner. On my way to the train, I dropped my friend a text that there was a change in plan and that he should meet me at my apartment for some serious meat. 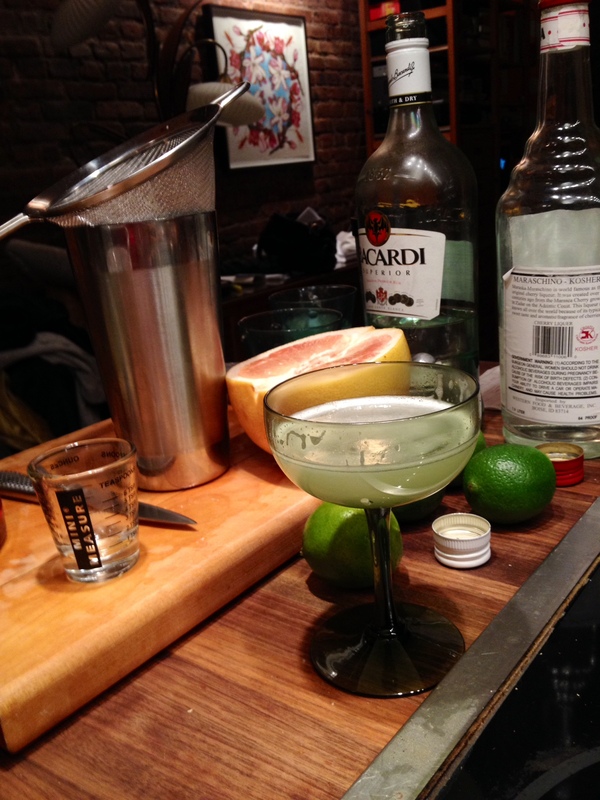 An hour later Justin arrived bearing the ingredients for Hemingway Daiquiris and I set to work preparing our feast. With the winter CSA season behind us and summer still months off, I find that I have to go to great lengths to get my quota of good quality fresh vegetables. Luckily, I had swung through the Union Square Greenmarket on my way to the workshop (which, incidentally, was in a very cool test kitchen behind an unmarked door). I kept the preparation of the meat and the accompanying dishes simple to highlight the mutton flavor. I stuck a cast iron skillet in the oven while it pre-heated. Meanwhile, I peeled and chopped a celeriac bulb, a couple of parsnips and a large sweet potato. I tossed these root vegetables with some sprigs of fresh thyme, a tablespoon or two of olive oil, and a good dose of salt and pepper directly in the hot skillet and left them to roast, stirring occasionally. 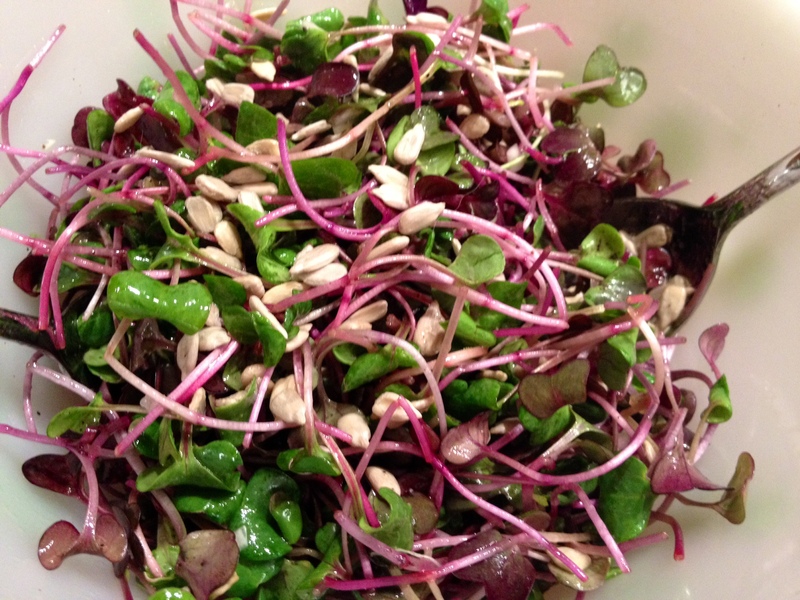 I tossed radish sprouts with sunflower seeds and a simple shallot, rice wine and sesame oil vinaigrette. I brought a large skillet up to medium heat with a tablespoon of olive oil and seasoned the room temperature chops liberally with salt and pepper before tossing them into the pan. I seared them for about five minutes per side and then set them aside to rest while I made a quick pan sauce. I poured off all but a tablespoon of the fat, placed the pan back over the heat, and added a couple of tablespoons of finely minced shallots and garlic. After a couple of minutes of constant stirring, I deglazed the pan with the dregs of a bottle of white wine. Off the heat, I stirred in two tablespoons of finely minced parsley and the zest of an old lemon that I unearthed from the crisper bin. 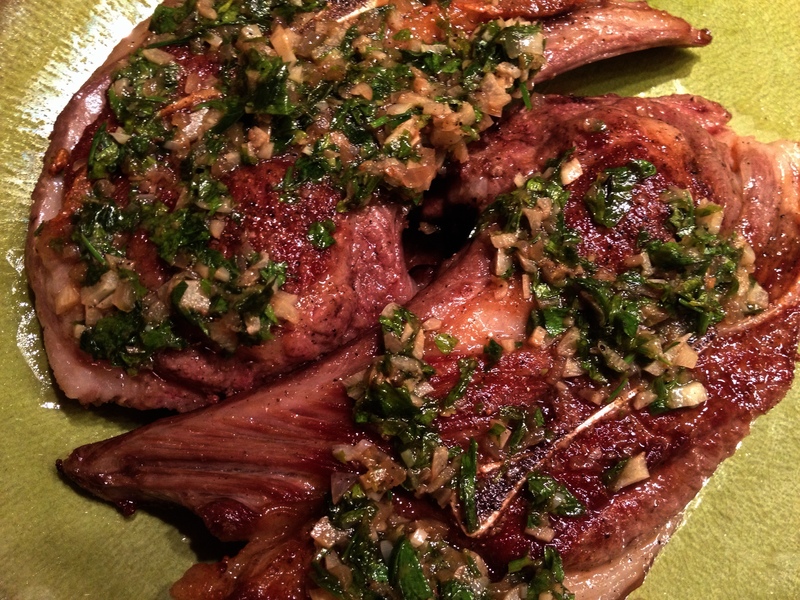 I drizzled the sauce over the chops and we sat down to some truly delicious mutton. This entry was posted in main courses, meat, salads and tagged lamb, mutton, radish sprouts by Jasmine Nielsen. Bookmark the permalink.